Welcome back! I hope you enjoyed Part 1 of my pilgrimage. My trips to the U.K. usually start somewhere north on the island and then I travel around, passing through my beloved Cardiff and finishing up inevitably in Dear Old London. Looking for the Doctor there? Well, there is another branch of the Experience at the O2 (I didn’t go), but for a step off the beaten path, why not check out the sprawling theatre scene? At any given moment, any number of the cast members you’ve seen rocketing around time and space on the teevee are engaged in their other job, namely treading the boards in the West End or further afield. Here’s a sampler from my time in London in 2012: James Corden (“The Lodger”) was in Two Men, One Guv’nor, Michelle Ryan (“Planet of the Dead”) was starring as Sally Bowles in the revival of Cabaret, and Billie Piper was doing previews of The Effect on the South Bank. I checked out a matinee of Our Boys, a dark comedy set in a veterans hospital, starring Arthur Darvill. Our beloved Rory Williams has more than a few arrows in his acting quiver, to say the least, as the play was an intense piece of work. The Duchess Theatre’s stage door opens onto the street right next to the box office; Darvill and the rest of the cast—which also included Matthew Lewis from the Harry Potter movies and I wouldn’t have worn my “Neville Would Have Done It In Four Books” shirt had I known I’d be meeting him—happily posed for pics and signed autographs after the show. 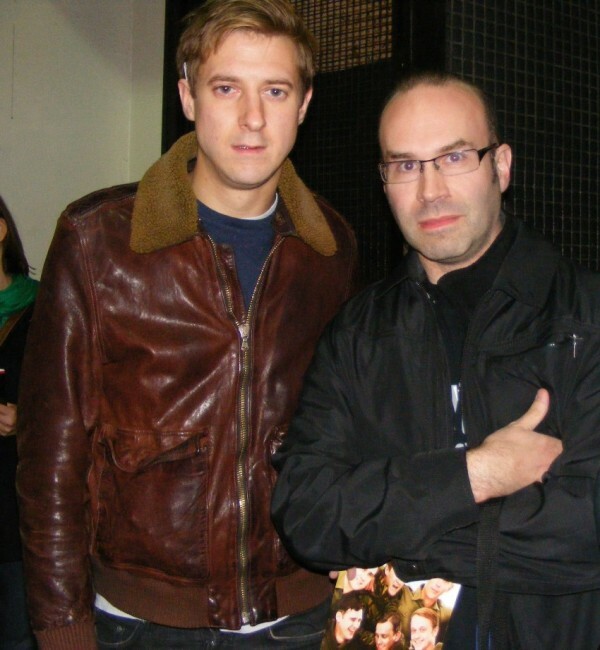 Our dashing author with Arthur Darvill, post “Our Boys” matinee. Darvill was once again onstage in 2014 in the stage adaptation of the film Once, but wrapped up his engagement in the lead role in May. Of upcoming interest to Who fans might be Stephen Daldry’s mounting of David O’Hare’s Skylight, starring Bill Nighy (“Vincent and the Doctor”) and Carey Mulligan (“Blink”), opening at Wyndham’s Theatre in June and scheduled to run until August 23rd. Finally, conventions. Britain is a small island. That may seem like a non sequitur, but bear with me. The fan community in the U.K. is just as fervent as it is in North America, and the love the British have for an institution like Doctor Who can’t be underestimated. There’s something so uniquely British about both the series and the fan culture that surrounds it, not to mention the way the star system works across the pond. 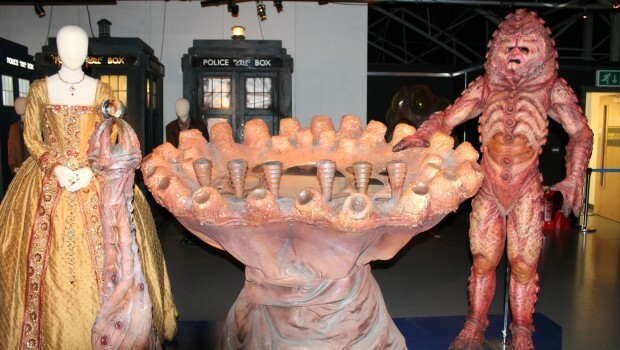 The most shocking thing I found when I attended Dimensions 2012 was just the level of access that fans Over There have to the actors, writers and directors of this iconic show. And nobody seemed to find it at all odd. Open up most any issue of Doctor Who Magazine and you’ll see quarter or half-page ads for signing events or conventions, and not always in the expected big cities. Sure, London or Edinburgh have their shows, but you’re also just as likely to see a notice advertising, say, Tom Baker and Camille Coduri signing DVD box sets at the Forbidden Planet in Barking, or Andrew Cartmel and Sarah Sutton doing a meet-and-greet in Essex. Unless you live out on the Orkneys, there aren’t many regions of the U.K. more than half a day’s train ride away; it’s not like living in Toronto and hearing about a great lineup at Gallifrey One in Los Angeles and scrambling for the resources to go. And unlike North American genre stars, who command massive sums to fly in for big fan events (your William Shatners, your Katee Sackhoffs, your…um…Adam Wests ), the celebrity circuit in the U.K. seems much more intimate and familiar. Once again, think of the small distances between towns. Then compare the thousands of dollars it costs organizers in Toronto just for the plane ticket to fly Patrick Stewart or James Marsters into town for a weekend to the fifty-odd quid for a round trip train ticket to get Sophie Aldred out to the Travelodge in Brighton for an afternoon. I’d first heard about Dimensions in 2010, right before a previous trip to the U.K. Just after I’d booked some non-refundable hotel rooms, I saw the ad in DWM: Peter Davison, Colin Baker, Sylvester McCoy, Paul McGann and a brace of companions and villains. I couldn’t go, and could have wept. When prepping for my 2012 visit, I made sure my holidays from work overlapped with the annual event. Dimensions is run by Tenth Planet (www.tenthplanetevents.co.uk ), who host smaller events all over the country throughout the year. This particular con is typically held at the Holiday Inn in Seaton Burn, a somewhat desolate stretch of wooded highway about half an hour north of Newcastle. Seaton Burn isn’t exactly a hopping burg: as far as I could tell it consisted of two hotels, a Burger King, a petrol station and a bus stop so you could head back into town and some semblance of civilization. With my tourist goggles on, I found Newcastle itself quite pretty, even if its version of the northern accent is fairly impenetrable to these Canuck ears. I’m sure even the TARDIS translation circuits would have a struggle with a Newcastle city bus driver in full Geordie. 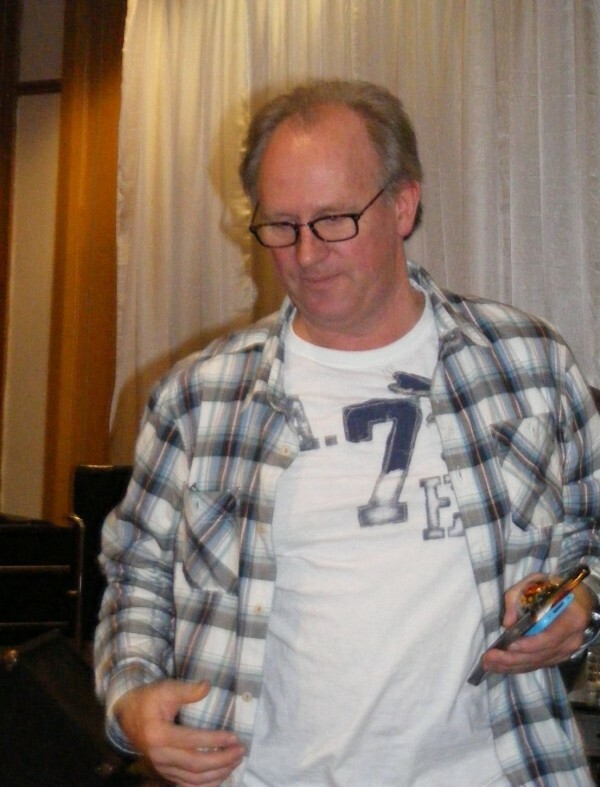 Peter Davison, sans cricketer’s uniform. The lack of amenities made the guest list that much more astonishing to me, though probably not to the veterans of the British convention circuit. John Levene (Sgt. Benton), Nabil Shiban (Sil), John Leeson (the voice of K-9), David Banks (the Cyberleader), Terry Molloy (Davros), Frazer Hines (Jamie), Louise Jameson (Leela), Michael Troughton (son of Second Doctor Patrick Troughton, he’s written a memoir about his father and has acted in several of Big Finish’s Doctor Who audio plays) and several other writers, producers and bit players. Plus there were a couple of charming gents by the names of Peter Davison and Sylvester McCoy. I had bought a Silver pass for the weekend, which got me photo ops with all the guests, two autographs from each (one could buy more head shots at the tables as well) and access to all the panels. I paid an extra £8.99 for a meet-and-greet with Davison, in which fifteen fans gathered around a table with the Fifth Doctor, took tea, and chatted amiably with the President of the High Council of Gallifrey about the BBC’s recent child abuse scandals, the sad rise of reality TV and the (then) upcoming 50th anniversary. To see Davison, who aside from a wee bit of receding hairline still looks stunningly youthful, kick back in jeans and a t-shirt with a cuppa and say “So what would you like to talk about?” ranks as one of the more surreal moments of my fan life. About a year later Davison was in Toronto for Reversed Polarity (usually called Polariscon, the event had been rebranded for the anniversary). I didn’t even bother meeting him a second time: colossal lines for photo ops, a cavernous hall for his Q&A instead of a small banquet room and swarming crowds cast the intimacy of Dimensions in stark and favorable contrast. 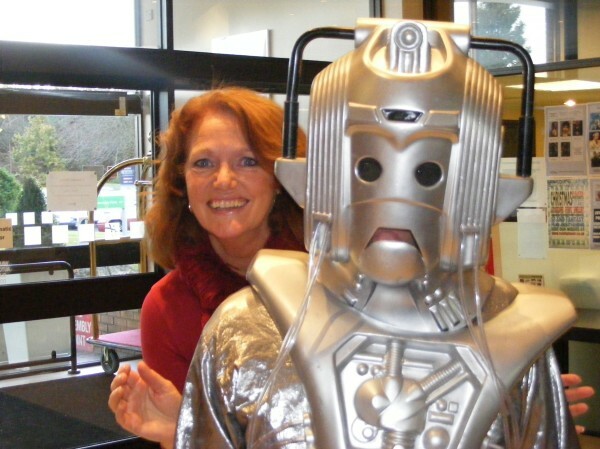 Other great Dimensions moments: Louise Jameson photobombing a shot I was taking of a Cyberman cosplay. My favorite Doctor, Sylvester McCoy, doing a bit of impromptu physical comedy and bodychecking me on the way to our photo op. Maybe best of all was John Levene’s big show on Saturday night. First was a charity auction to raise money for Project Motor Mouth (benefiting Janet Fielding’s cancer fight), then Levene launched into an hour of standup comedy and musical numbers. The comedy itself was classic borscht belt material (“I know this couple who went to North Wales on their honeymoon so he’s going to Bangor for the first time!”), which he sold with evangelical fervor. He’d been planning on doing some numbers from his new album (of COURSE he had a new album!) but as the karaoke backing track that had arrived was at a different tempo from what he’d rehearsed, he didn’t feel quite confident in that. So musically we were treated to a quite loving “Lady in Red,” and then he led the crowd in a rowdy singalong of “I Want To Know What Love Is.” I swear, I will never look at the UNIT years the same way again. Look at that face. He really wasn’t happy about being photobombed! There were maybe a couple hundred or so guests, if that, at Dimensions 2012; I had to leave fairly early on Sunday so I don’t know if a larger crop showed for the second day. A guest lineup like that in Toronto would have them lined up around the Metro Toronto Convention Centre, I suspect. Which goes to show what I was saying before about access: there’s a certain intimacy between the historical figures of Doctor Who and their British fans unlike anything we experience here in North America, largely due to the completely foreign type of convention circuit. Several times I’d be standing in line for an autograph, and I’d be talking with some gent holding a hardcover volume in which there were literally seventy signatures, the John Hancocks of just about everyone associated with the show, living or dead (“…and that’s Nicholas Courtney, there’s Bonnie Langford, there’s Lis Sladen, bless ‘er, there’s Mary Tamm, that one is John Nathan-Turner…”). The stars knew these fans, some by sight. Eventually these folks would meet everyone several times over, but it came across as a fun hobby, not a stalkerish obsession. By the time I left to catch my train back to London on Sunday morning, everyone milling around the Holiday Inn was on a first name basis with each other. I should clarify: the Toronto area does have its smaller conventions as well. 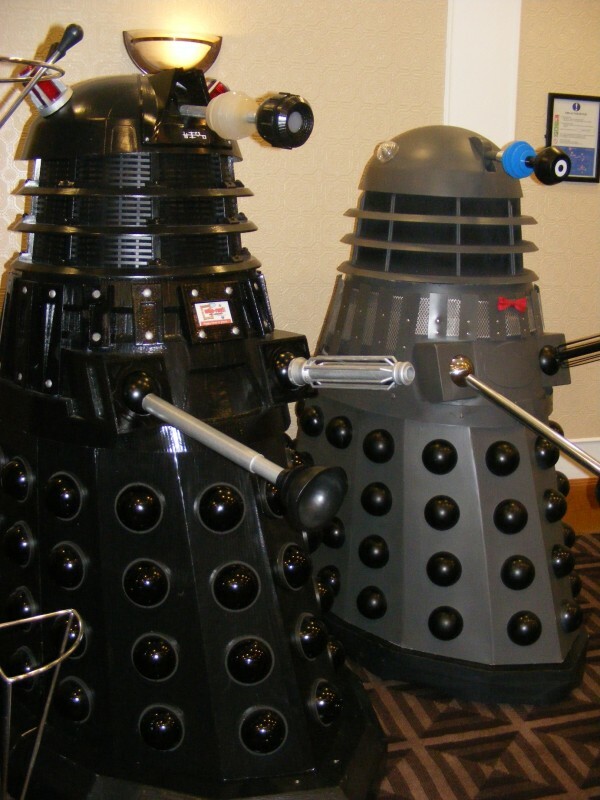 A week after I returned to Canadian terra firma in 2012, The Doctor Who Society of Canada held its Who Party, where guests included “The Fires of Pompeii” writer James Moran and “Rise of the Cybermen/The Age of Steel” actor Colin Spaull. Then the very next day I trekked out to Guelph for GenreCon, which that year featured Buffy’s Nicholas Brendan and Tom Lenk. However, the kind of small event at which genre stars are featured guests is a relative rarity: outside the huge FanExpo/Toronto Comic Con axis—the organization behind which was recently bought by the same company that runs San Diego Comic Con—small conventions around Toronto are largely devoted to anime and don’t serve the science fiction TV crowd quite as well. The United Kingdom does have its huge conventions of a scale not unlike SDCC, Atlanta’s DragonCon or FanExpo, such as the MCM circuit and the London Film and Comic Con, but Dimensions showed a different side of the fan world to me, a much more egalitarian and friendly one, and that seems to be much more the norm across the pond. As I finish writing this report, I’ve been back for less than a week and am already itching to head back over to the United Kingdom. There’s still more Doctor Who stuff to see! While on this year’s trip I missed Collectormania in Milton Keynes, which featured a good dozen or so of the show’s alumni as signing guests. There’s the London installment of the DWLT to try, and how about a countryside jaunt to Stonehenge to visit the site where the Pandorica was buried? The possibilities are endless for the non-British fan with a yen to travel the highways and byways of their favourite television Time Lord.